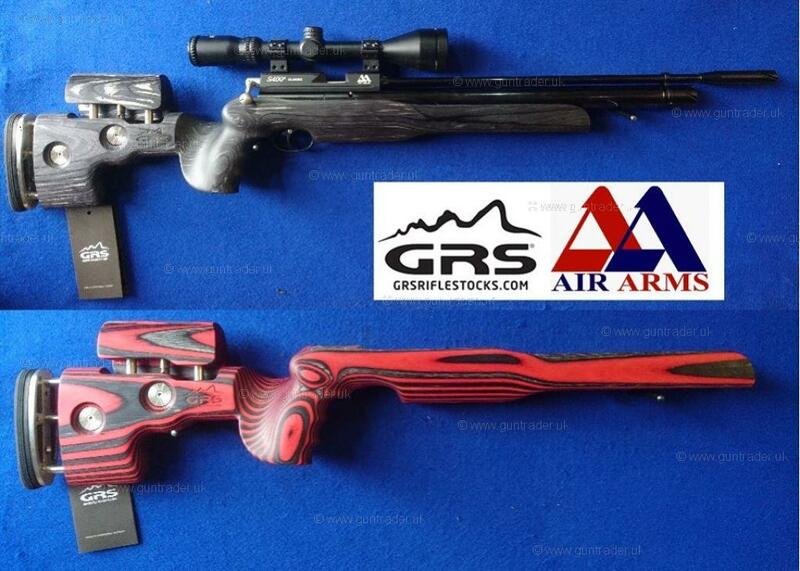 Air Arms .177 S400 S410 S510 STOCK ONLY Pre-charged Pneumatic New Air Rifle for sale. Buy for £599. Based on the hugely popular GRS Sporter model, the PCP Sporter series is packed full of features that not only look good but are very functional. A full and wide fore end gives a good grip and helps improve the standing shooting position. This is also fitted with a Target UIT Rail for the addition of various target add ons. The grip has a 6 degree angle to the side to aid the shooter to an ergonomically correct position. The cheek piece and recoil pad are easily adjusted with pushbuttons using the new and updated SpeedLock system. In addition to this, the PCP Series is fitted with a Height Adjustable recoil pad for even greater adjustment. The result of this is a stock that is completely versatile and can be adjusted very precisely for length of pull, drop at comb as well as height of recoil pad. The new system is 40% stronger than the previous version and now stops on maximum adjustment. The SpeedLock system allows you to quickly adjust the length and height of the stock between shooting positions; no tools needed! Name: Portsmouth Gun Centre Ltd.